In concert with Monday's WWDC 2016 announcement, Apple launched a revamped informational resources section on its developer portal, which includes articles, technical insight and real world examples designed to help new coders get their start on the App Store. 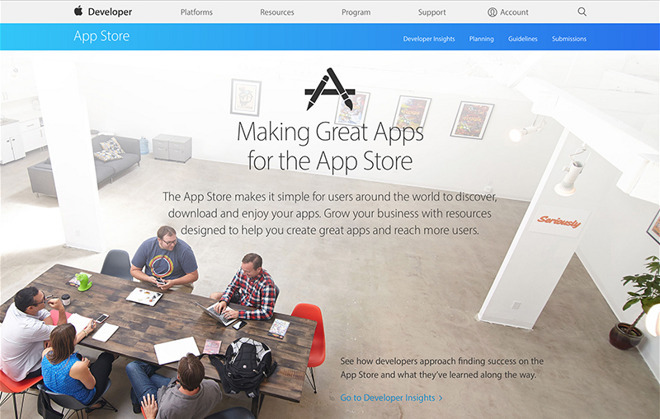 The new "Making Great Apps for the App Store" mini-site is split into four distinct sections: Developer Insights, Planning, Guidelines and Submissions. Developer Insights throws a spotlight on success stories like games maker Seriously, Evernote, Carrot Weather app developer Grailr and Smule. Each profile includes a company overview and interviews with developers, who discuss a key App Store tools or helpful features like app localization and app updates. The Planning section offers developers a wealth of information on how best to position their software for public debut. Much of the information was available in previous versions of Apple's developer portal, but each page has been revamped with a fresh look and layout. Here developers can discover how to build an App Store presence, conduct business in a digital storefront, expand their audience and more. New tutorials have also been added and include "Discovery on the App Store," "Using the Freemium Business Model" and "Engaging Users with App Updates," among others. Apple's Guidelines webpage links to a number of existing assets relating to the app review process, human interface and marketing guidelines, and rules covering Apple Pay and Apple Wallet. Again, the informational assets are laid out in a cleaner, more user-friendly format than previous site iterations. Finally, developers learn how to submit their wares to the App Store in the Submissions section, which goes over app building with Xcode, review guidelines, app optimization, beta testing and the app submission process. A vital part of Apple's iOS, OS X, watchOS and tvOS ecosystems, the various App Stores not only generate major revenue, but also serve to increase platform stickiness. To maintain its lead as the world's premiere app distribution network, Apple holds an annual conference at which current and future developers can interact and learn fro Apple software engineers. This year, the Worldwide Developers Conference runs from from June 13 through June 17 in San Francisco. Ticket registrations for the event opened earlier today.